Private investigator Jonah Geller’s life has taken a nose dive -- he fouled up an undercover operation leading to him being shot, a cop being paralysed, and a high ranking member of the Toronto mob, Marco Di Pietra, walking away from a conviction; his girlfriend also threw in the towel and him out; and he’s plagued by nightmares from his time in the Israeli Army. His boss at Beacon Security now has him pretty much desk bound. One of his colleagues, however, wants him to do more than type up notes; whilst Franny plays around with his girlfriends, Geller is checking out a neglect case at a nursing home. Geller is happy to be back in the field, but is less content when Dante Ryan, a local hitman, turns up at his apartment wanting help to identify who’s commissioned him to murder a local pharmacist, his wife and kid. Ryan draws the line at killing the latter two, but know it might come at the expense of his own demise. In fact, he wants out of the mob altogether. Shortly after Geller is attacked and Franny is murdered. Whilst the police would like Geller to come clean with what he knows, his pact with Ryan makes that difficult, and the two become bound together in a dangerous investigation concerning the illegal trade of prescription medicines into the US. 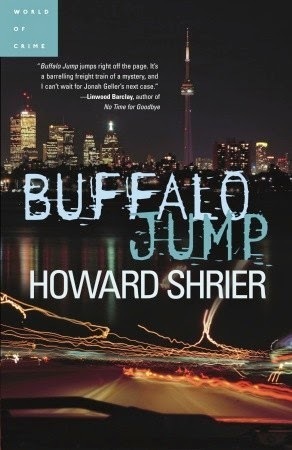 Buffalo Jump is the first book in the Toronto-based Jonah Geller private investigator series. 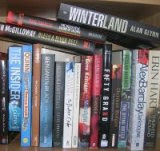 For me it was a book of two halves. The first half was quite pedestrian and I felt little affinity for the tale or the characters. About halfway through, however, the story seemed to shift register and became more engaging and compelling. In part, I think, this was because Geller became more multidimensional as chunks of his back story were divulged (he’s the usual flawed, damaged, independent PI, but has enough twists that he doesn’t neatly fit the mould), his relationship to the hitman, Dante Ryan, developed through a nice set of interchanges, and all the various plot strands started to be woven together into a clearer tapestry. Indeed, the plot focus on the illegal cross-border trade in prescription medicines provided a nice hook. The denouement seemed a little rushed, but nicely tied off the tale. Overall, a decent, if a little uneven, read that introduces an engaging lead character that I’d be happy to spend more time reading about.